Last week, I had a chance to visit the Sprint M2M Collaboration Center in Burlingame, California — about 20 minutes south of San Francisco. While most are probably unfamiliar with the term M2M, this technology is likely already a part of your every day life. This new center, which had a grand opening late last year, is a workshop for enterprise customers to take advantage of Sprint resources including engineers and equipment to experiment and develop new devices — hopefully to bring to market at some point down the road. I also had a chance to chat with Wayne Ward, Vice President of Emerging Solutions for Sprint, who leads this project and provided many interesting insights. M2M stands for machine-to-machine, a technology which lets devices communicate with one another. Although the definition technically applies to wired equipment as well, I am going to focus on wireless ones since Sprint is of course a cellular carrier. 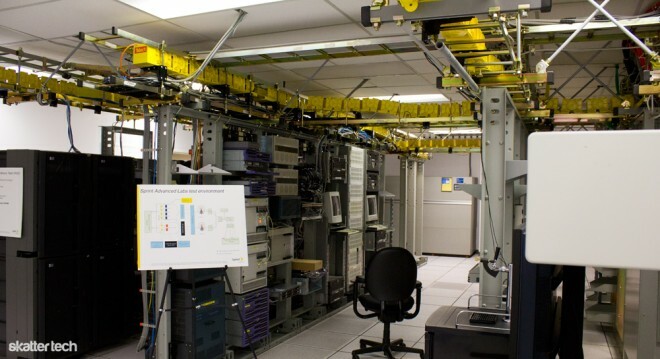 There are tons of applications for M2M, many of which will resonate with the average person. Use case scenarios in the health care industry are a great example since this technology is perfect for remotely monitoring patients. For instance, a physician can track a person’s blood pressure or heart rate in real-time. It could even be a self-serving solution embedded into a weight scale which would ideally upload your information to a web service for analysis, diet recommendations, and a workout regimen. 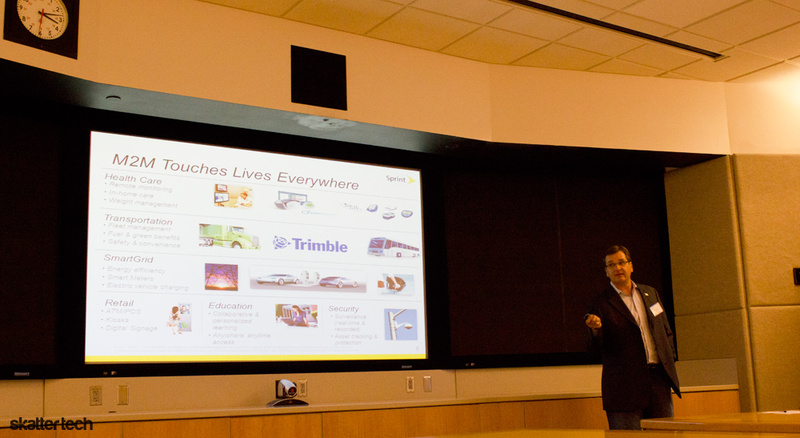 Greg Brott, Vice President of Channel Development for Trimble, spoke at this media gathering to describe how his company uses M2M to track a fleet of drivers. With GPS modules paired with a cellular connection, Trimble lets employers track whether employees are driving on the right track, reaching their destinations on time, or even their duration of work. When it comes to energy efficiency, smart meters are the latest buzz. These devices — when plugged into the side of your home — can help electricity utility providers monitor and mange their grid intelligently. PG&E which serves electricity (and gas) to nearly 15 million customers in California uses a similar idea behind their RF-powered Smart Meters already. M2M technology can even help electric car charging stations select the best time of day when rates are the least to recharge your vehicle. While the average person will hopefully never have to hear this acronym, M2M technology will end up in more and more places. Wayne Ward noted that there will be an estimated 120 million M2M devices in North America alone by 2015 and about 412 million M2M devices across the world by 2014. With an inevitable influx over the next few years, I asked Ward about congestion especially since the majority of M2M devices are apparently on a 2G network. He responded that most of these devices are only transmitting bits of data (e.g. statistics), which is relatively minute compared to streaming a high-definition movie for instance. Although Ward had already noted that an estimated 12.6 million 4G powered M2M cellular models would ship by 2015, he elaborated that Sprint would intelligently decide which type of network is best suited for each application. This means health monitoring or fleet tracking can take advantage of the more affordable 2G networks since there is very little data involved while a security camera will likely run on 4G for uploading large chunks of video. M2M devices can even put WiFi to use with several components connecting to a single parent with cellular connectivity to further reduce congestion. I have at least 25 networked devices in my home. Everything from smart phones, tablets, laptops, desktops, TVs, set-top boxes, to gaming consoles count. While most of these would fall under a different category, Wayne Ward believes consumer electronics and M2M devices will converge. Going beyond smart meters and electric car chargers, common everyday household technologies such as a security system, climate controls, or lighting switches are perfect candidates. As of today, partnerships between carriers and service providers have generally covered the network costs for M2M devices. For instance, Amazon does not charge Kindle owners monthly fees for downloading new eBooks over a 3G connection. However, as M2M devices converge and overlap with consumer electronics, Ward envisions a business model where consumers can pay a single rate to share a pool of data between all devices rather than having to pay several bills. Why Is Sprint Pushing This Initiative? Opening the collaboration center is an investment as the location will ideally help customers bring more M2M products and services to the market faster. For those wondering, other carriers such as AT&T, T-Mobile, and Verizon Wireless already have M2M offerings as well. Of course, Sprint will make money when companies build devices which need to use their network. 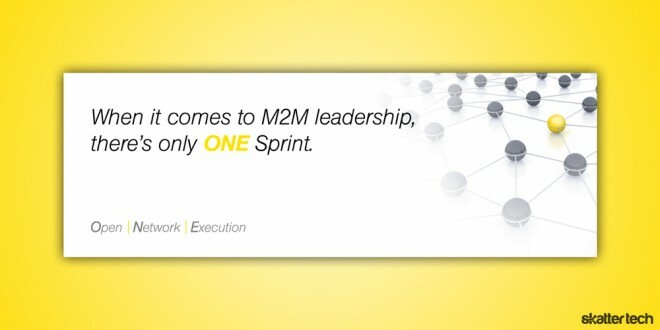 Although M2M segment probably only accounts for a fraction of revenue for Sprint each year, things might change down the road. Therefore, it is vital for Sprint to secure enterprise customers since the number of application-specific devices are growing rapidly.